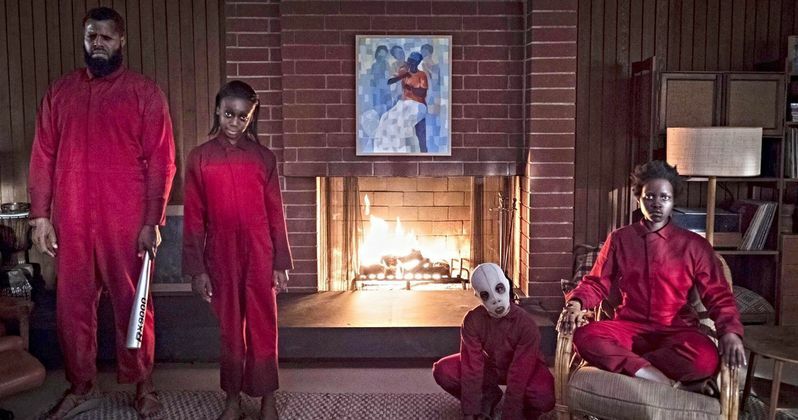 Get Out writer-director Jordan Peele's new nightmare Us had its world premiere at the SXSW Film Festival back on March 8th and has since been getting all kinds of praise. In fact, the appreciation for Peele's new horror movie might just be good enough that very soon here people will, you know, stop calling it a horror movie. But no worries fellow horror fans, Peele himself is coming to the movie's rescue already, making sure to let us all know over on Twitter that Us is 100% a horror movie. "Us is a horror movie." That tweet may seem like a strange thing for Peele to put out there in the world, and it might look even more bizarre that we are reporting on it. But it's more than meets the eyes. Stick with me here. All of this silliness reached a fever pitch a few years back when the Golden Globes nominated Peele's debut film Get Out for "Best Comedy or Musical." Remember that? Now I'm sure there aren't many people out there that saw Get Out and would try to argue that the motion picture was a musical. If that person does exist though, I'd like to meet them. But anyhow, there are quite a few people out there that seem to think that this Golden Globe's label of "Comedy" fit Get Out. Not sure why. At best, the movie was a deadly serious satire, like if South Park and The Twilight Zone had an awesome baby. But comedy? I don't think so. Lil' Rel Howery's Rod "TSA" Williams was pretty damn amusing, but seriously the man had like four funny lines throughout the movie. Four funny lines do not a comedy make. I get why Peele would go out of his way to point this out. It's far too often in our beloved genre for people to want to call a movie anything but horror. In fact, most of the time it's amusing to see the backflips casual moviegoers will go through trying to label a film "a psychological thriller" or a "suspense film" when a horror movie is more than a masked killer stabbing teenagers to gallons of gore. This rant is all to say that more mainstream movie audiences seem to think that a "horror" movie is actually a "slasher" movie and anything that doesn't adhere to the slasher rule book is then not horror but something more... prestigious, I guess. But thanks to Peele's black and white update today we know exactly where the filmmaker's ultimate intentions lie. Us is written and directed by Peele who also throws in his hat as a producer on the horror movie alongside Jason Blum of Blumhouse Productions (Paranormal Activity, Get Out, Happy Death Day), Ian Cooper and Sean McKittrick (BlacKkKlansman, Donnie Darko). The film stars Lupita Nyong'o, Winston Duke, Evan Alex, Shahadi Wright Joseph, Elisabeth Moss, Tim Heidecker, Yahya Abdul-Mateen II, Anna Diop, Cali and Noelle Sheldon, Duke Nicholson, Kara Hayward, and Nathan Harrington. The film was initially scheduled for theatrical release on March 15, 2019, but was pushed back a week to March 22, 2019, following the announcement of its South by Southwest premiere. Us is projected to gross $35-40 million in its opening weekend. This update comes from Jordan Peele over on Twitter.